In the seventies there were a lot of reasons for smoking. Smoking was cool. David Bowie smoked. John Travolta did. So did everyone else. Advertisements for smoking where everywhere. Cigarettes were cheap. But the main reason for smoking was no doubt nicotine. Smoking is highly addictive and we now understand that people do not smoke out of free will. They smoke because someone else wants them to. Smokers are victims not perpetrators. The same goes for smartphones. Ninety percent of the time we are on our smartphones we are using an app. Most of the time this is an app that is designed for addiction, or as Nir Eyal puts it: to be ‘habit-forming’. App-designers are very successful at this. They figured us out and they know which buttons the push. We use our smartphones heavily because someone else wants us to do so. This means that (heavy) smartphone users are victims too. Not perpetrators. This is a very important paradigm shift. Perpetrators should be punished. Victims should be helped! Think about this when you are telling your children to get of their Phone. There is also something called second-hand smartphone usage. Involuntary exposure to smartphone users. The most prominent example is of course when you are hit by a texting truck driver but there are more subtle ways of second-hand smartphone usage. Suppose you prepared a presentation for a meeting only to find out everyone is checking their phone. Or maybe you are having a conversation that is deteriorating because you are being phubbed (a contraction of phone and snubbed). Or you are a teacher talking to Apple and Samsung logos. Or you visit Auschwitz only to see people making selfies of the ‘Arbeit Macht Frei’ – sign. 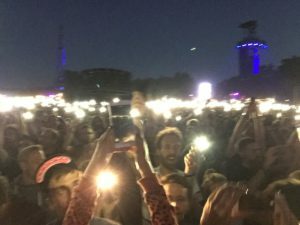 Or maybe you go to a concert and find yourself surrounded by people taking pictures, filming and posting and then frequently checking for likes. Hard to get in the right vibe then! It is not a problem if people are staring at their smartphone in the waiting room of the hospital. Waiting rooms are boring. It is a problem when the world you live in, when parties, barbecues and dinners start to look like waiting rooms. In The Netherlands we used to have a famous advertising slogan: Smoking? We will figure it out together! Guess what, we didn’t. No wonder, the slogan was made up by the tobacco industry. It was a distraction maneuver. They knew we wouldn’t figure it out together. We needed some rules and some law. Same goes for smartphone usage. We used to smoke everywhere. Later more and more no smoking zones appeared and now sometimes you find yourself smoking in an aquarium at the airport. This works. There should also be more and more no smartphone zones. Occasionally there is a restaurant or a bar with a no smartphone policy. Or an expensive resort without internet connection. Offline is the new luxury. This has to become more commonplace. Concert halls, train carriages, offices, classrooms, bars, restaurants, cinemas, sections in soccer stadiums and so on. Not to irritate or frustrate people but to help them. Remember heavy users are victims that need to be helped. No smartphone zones help you concentrate on the thing you came for in the first place. And at the same time you are also providing options for people who do not want to be exposed to second-hand smoke. Maybe we will organize ourselves, more likely we will need no smartphone zone rules or a law. Like we see at schools in France. We levy excise duty on tobacco products to discourage smoking and to use the money for anti-smoking campaigns or healthcare. Why don’t we levy excise duty on our apps? Most of our apps are free. Okay, we pay with our data, but most people do not seem to care. Or understand. Do not get me wrong. The most important reason to tax our apps is not to discourage users but to make them think. We compare costs and benefits to make a decision but if there are no costs, we stop doing this. The result is that we do not demand better apps. We just use our ‘free’ stuff thoughtlessly. If we want people to think, if we want them to become critical consumers, we have to end ‘free’ apps. We can excise levy duty or draw up a law that forces the technology companies to sell their apps for money. After all, it is also no longer allowed to distribute cigarettes for free. It is way easier to make better apps than to make better cigarettes. We only have to ask for it. We decide with our money. Just like we asked for salads at McDonalds. We have to ask for apps that know that we are driving our car or biking and stop harassing us. If my 13 year old daughter bikes through heavy traffic she has a device in her pocket that is working hard to get her attention. That is almost immoral. We need to ask for apps that know that we are eating and donâ€™t disturb us. Apps that are way better in selecting which notifications are important and which are not. We need apps that register that our children have seen three consecutive episodes of Sponge Bob and tell them to go play outside instead of forcing infinite episodes. Or apps that come with automatic user time limits. If I were a smoker I would always choose cigarette packages with the warning message: ‘Smoking Causes Impotence’. As a father of two children impotence sounds a lot better than Deadly Lung Cancer. There is a lot of debate on the effectiveness of these warning messages but there is clear evidence that the warnings increase consumer’ knowledge about the health consequences of tobacco use. Smartphones should come with the same warning messages. Android P and iOS12 are already moving in the right direction informing the user about the amount of time spent on the phone. Maybe they should also inform us about the negative consequences of using too much social media or using your phone right before you go to sleep. Or when you are biking. Or in a car. Or if you use your phone first thing in the morning. Maybe they should warn us that if we play Candy Crush Saga, the game actually is playing with us. 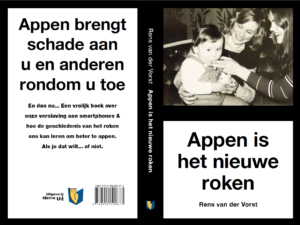 Rens van der Vorst is technophilosopher at Fontys University and author of the book Smartphones are the New Smoking (only in Dutch as Appen is het Nieuwe Roken). Download an e-pub or buy a copy here.